Well, here we are on day 2 of Expedition 329! The seas are still a bit choppy but everyone seems to be getting used to it. The sky is mostly cloudy; not quite what you think of when you think South Pacific! Last evening the hard rock geologists met with some of the microbiologists to discuss how the rock cores from the first site would be sampled. The coordination between the two groups is important to ensure that everyone gets access to the samples that they need for their own research. Compromises are an important part of working as a group. 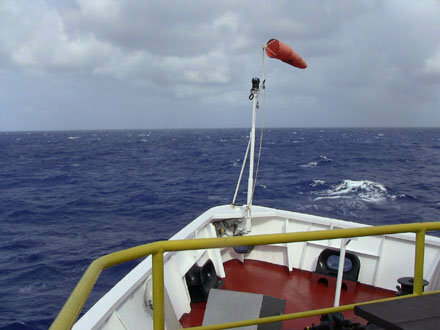 The scientists on board are from many countries and universities and often do not know each other. They are meeting for the first time aboard the JOIDES Resolution and getting to know each other. This expedition is much different from most in that it is about microbiology, not microfossils. Scientists are studying microbes that are in the sediments; things that are alive today, rather than evidence of past life. This is presenting some interesting problems since contamination of the cores and samples must be minimized. Some microbiologists on board think that microbes may exist in the solid basalt bedrock, probably in small numbers though. One of the discussion points in last evening’s meeting was that surface seawater is used to help lubricate the drill bit and remove drill cuttings from the hole and this would introduce microbes from the surface to the core. The question became, would any cultures of the basalt show surface microbes or microbes living within the basalt? We will find out before this expedition ends. I for one can’t wait to find out the answer.